And today is election day. And we will, as black women have always done, do what we have to do. Black women, in the past, right here and now, everyday in the future, NEVER DISAPPOINT. Never. You will know that we rise, we go to work (the many ways we work), we endure, we come home, and we pull every tool out of our tool box in the name of our absolute own agency. Even when our toolbox has been stolen like the many voter registrations that have been purged from the rolls in Georgia. Even when we will be docked an hour’s pay by relentless bosses who refuse to compromise for employees who live in counties where there isn’t even a single polling location. Even when it rains. Even when we are late picking up our children or other people’s children. Even when the value of voting is theorized and made a conspiracy in our own homes, we do what we have to do. WE VOTE. We absolutely are Harriet’s daughters. We believe in our own survival more than anyone’s. We don’t need anyone to tell us what it means to be marginalized, to be embarrassed, to move on in a world that requires us to suffer daily. It does my aunts, my mother, nor I any good to live in the corners of news stories. To wash our anxieties in polls. We don’t get to be wrapped up in in the ideologies. We don’t theorize, we move. We survive by pulling whatever lever of change we can. We do as we are told by our bodies, to always do what we have to do. We do it in pain. In strength. In conviction and lack there of. In our limits. In spite of. On the backs of. In the name of. In the spirit of. With the burden and none of the victory. Through the patronizing and doubt. Through the lack of donations for our own candidacies. We do. We give. We take it to the field, we leave it all there, and we never let the fire replace the duty. We trust. We verify. We dignify. We validate. We do so as the women before us. By grace. And with humility. And gratitude. Loud. And silent. As one. And as many. We vote. For Stacey. And for Andrew. And for Antonio Delgado in New York. For Mandela in Wisconsin. For Debbie Stabenow in Michigan. For Lucy McBath in Georgia. For Beto in Texas. For Heller in Neveda. For Ayanna. For the glass ceilings and for the positions we’re overqualified for. For every street we’ve canvassed. For every voter we called. For every lit we’ve dropped. For every bottle of water we dropped off at every polling location. For every volunteer. For every lawyer. For every black woman who is too upset to lean in to this election. For every black woman who bought a plane ticket. For every black woman on the road to a field office. For every train ticket. For every black college girl canvassing for the first time. For every dog that chased you. For every piece of data you put into the system. For every brunch. For every voter registration you put in. For every dollar you donated. For every house party. For every moment, every thought, every ounce of your energy you gave to this election. When it hurt. When it left you in astonishment. When they spent too much airtime on winning back white women and losing white working class men. I appreciate you beyond my level of ability to express it. I thank you. For what you do. For what you’ve always done. For doing what you have to do. For the pundits who ever doubted us. And the white women who refuse to follow us. In black women we trust. Our agency has always been stronger than our pride. And to the places where we lose. 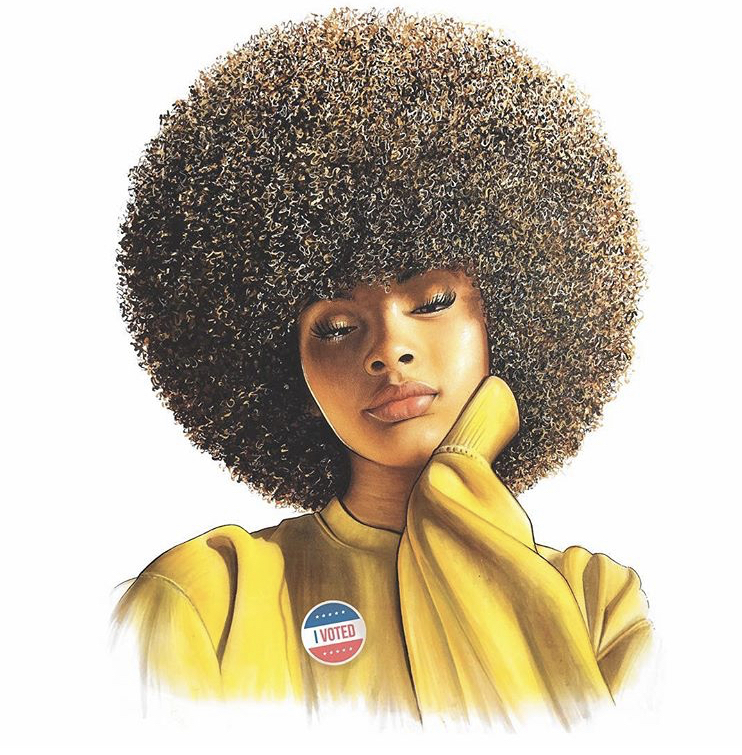 I am so proud today to be a Black woman in this country on this day because I don’t see need to see the results to know that Black women did what they had to do. Because I know that my sisters got me, as they always have. And as they always will. This ain’t on us. Never was. I’ve never felt so uninspired in my life. Every white girl friend of mines and her mother is posting inspiring reasons to support Hillary Clinton. Every news outlet is trying to scare me but poking fun of a giant that I am convinced is a figment of the media’s imagination. I barely watched the first presidential debate. If it weren’t for twitter I would know very little about the consistent media gaffes being made by Donald Trump. I don’t know if I’m mourning the eventual loss of the fabulousness that is Michelle Obama too soon or if I am trying to preserve my sanity. It’s all just happening too fast. I’m still shocked that Donald Trump went to the US/Mexico boarder after saying such egregious things about our largest immigrant group. But it seems the world has moved on to the new thing. The next big racist, classist, sexist, xenophobic thing he has said. As if this is…normal. I’m inundated everyday with humanizing stories of Hillary Clinton and accusations of internalized sexism, and downright hateration if I’m not signing every Facebook post with an #Imwithher. I mean, listen. The only her we acknowledging in DC right now is Michelle. I used to believe in something. I used to believe that politics could harness a power in a people so deep that it could shake the very fabric of a nation. I believe in that still. I used to believe that representative government has the power to shift a landscape for generations of people. Like the Voting Rights Act. Like the Civil Rights Act. Like the Good Deal and Obamacare. I used to believe in good government done well and with the people, mainly with marginalized, underresourced people in mind. I used to be moved by elections. I used to feel fire in my bones that would call forth the grand ancestors in my spirit. I used to feel compelled to walk miles for the dream. For hope. For the possibility of freedom. For a better tomorrow. Perhaps it’s the ill address of my people’s slow genocide played out on national television. Perhaps it’s the lack of awareness that as women, some of us are brown and black, and all of the thee above. Perhaps I don’t see any in’s for me. I don’t hear anyone speaking to my concerns. Perhaps I haven’t heard about how we will fix the judicial system, ensuring police officers be tried by juries and not police union controlled judges. Perhaps I want to hear what these candidates haven’t done to make it easier to live in this skin in this country in THIS time. I don’t ever feel scared. And I want to feel scared. But the truth is, I feel mainly let down and uninspired. I’ll vote on November 8. Because I vote in every election as a matter of principal. But I’ll do so much different than I have before. In a space somewhere between uninspired and unimpressed. Because if this is all we have, we don’t have much.